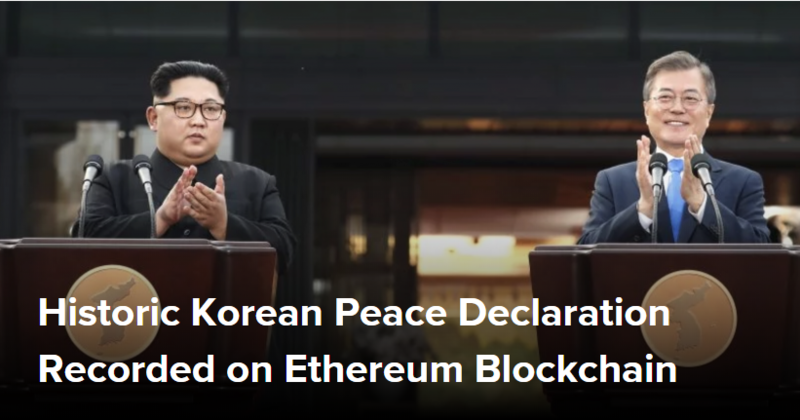 The historic moment when leaders from South and North Korea met on April 27 and signed an agreement for peace between the two nations has now been permanently recorded on the ethereum blockchain. According to a report from CoinDesk Korea, Ryu Gi-hyeok, a 27-year-old game developer from South Korea, has coded the Panmunjom Declaration, which includes the line “there will be no more war on the Korean peninsula,” in both Korean and English and stored both versions in two ethereum transactions. Inspired by activists of the #metoo moment in China, who used the ethereum blockchain to record messages as a way to evade internet censorship, Ryu said he is also planning to launch a website service that will “keep all historic records permanent and immutable” on a blockchain. Posted May 4, 2018 by hub_admin & filed under FinTech, News.